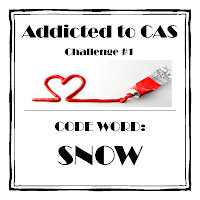 Its time for a new CAS-ual Fridays Challenge! She has the coolest FLAIR buttons ever...its on my wishlist for quite while now! I reached out for my CAS-ual Fridays Stamps - Snowflake Greetings set once again. Its an amazing set ...can be used for any holiday or winter themed project. Little Miss Muffet Challenges: Tags. Divas by Design: Glitter and Sparkle. Whimsy Inspiration: Traditional Christmas Colors. So play along with us @ CFC ...you've until next Thursday 12 PM . Here is a card for this week's CASE STUDY Challenge. This month's muse is Angeline Yong ...her creations are absolutely amazing!!! Its almost the end of the month, so didn't want to miss out on the chance of CASING her creations...so quickly made something for the last challenge. 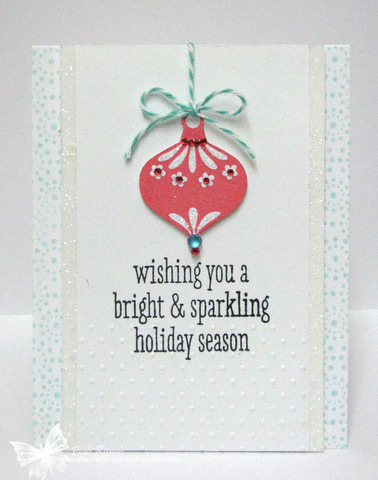 A simple holiday card with lots of Sparkle and Bling!! All stamps are from Hero Arts. All rhinestones from Pizzazz Aplenty. 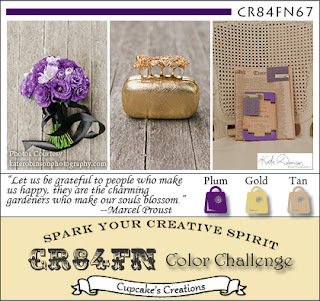 CASE Study Challenge: CASE the Inspiration card. 4 Crafty Chicks : Ornaments. 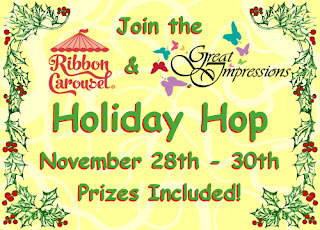 Welcome to Ribbon Carousel and Great Impressions Blog Hop!! I used some gorgeous Crushed Green Ribbon and some Jute Twine from Ribbon Carousel. The designer paper is from Echo Park -Very Merry Collection. 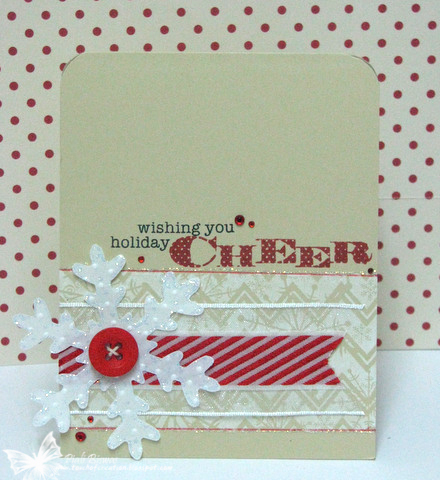 Crafty Sentiments: Red, White & Green. Going Grey With Scrap-Creations : Merry Christmas. Hop along with us today and leave some blog love for our Ribbon Carousel Crewmates and the Great Impressions designers to be eligible to win one of the 2 prizes up for grabs! We'll select 2 random commenters from 2 randomly selected designer blog, so be sure to spread the love around! I used Wplus9 - Folkart Flurries set for the snowflakes. 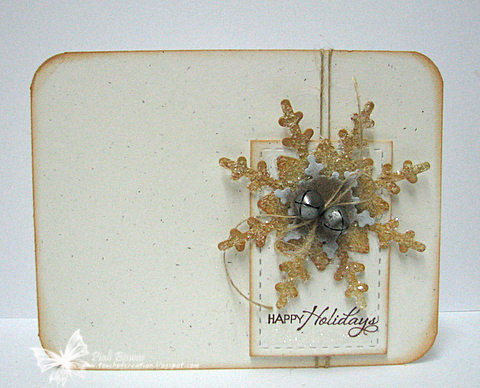 The Sentiment is from CAS-ual Fridays Stamp-Snowflake Greetings set. The Insta Camera die is from Lil' Inker Designs. The Snowflake die is from Marvy. Just added a button, jute twine, Diamond Stickles and American Craft Glitter tape for extra sparkle & shine. Elke Kaart Een Feestje : Non Traditional Colors. The Snowflakes are the leftover diecuts from that card set! I love this Simple Snowflake Die from WPLUS9. I thought of using both positives and negatives of a diecut shape...no waste at all! A very simple yet lovely design! I used Diamond Dust for the sugar cookie look. The stitched mat is from Lil' Inker Designs. 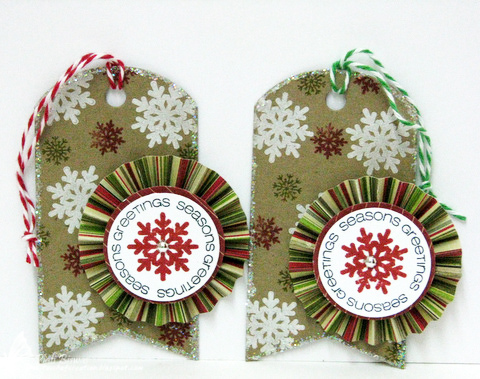 I used some May Arts Jute twine and jingle bells for embellishments. The sentiment is from Verve stamps. The Crafty Pad: Add some Glitter. Love to Create : Non Traditional Holiday colors. 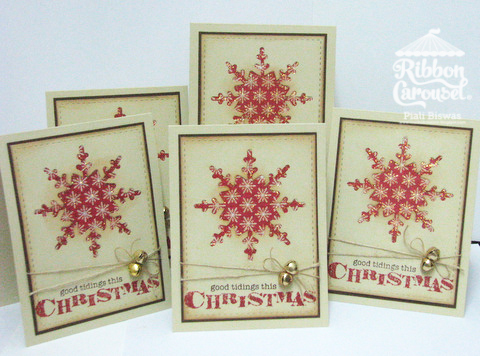 Totally Stampalicious : Let it Snow. Are you done with your Holiday cards?? When are you going to mail them? Do make your cards or buy them?? For me,I'm not done yet... I've quite few more to make . I'll be back later with another lovely holiday card set. 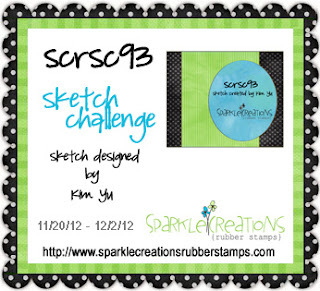 Its time for Sparkle Creations Rubber Stamp Challenge #93. I used cute Snowbunny Lucy for my card today! The DPs and sentiment sticker are from Echo Park-Very Merry Collection. Crafty Boots : Anything Goes. Forever Friends: Glitter & sparkle. 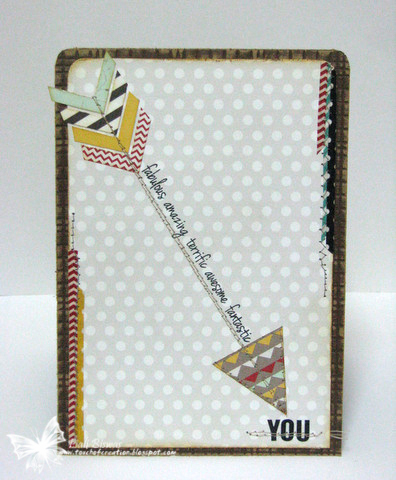 Paper Pretties Monday Challenge : Anything Goes. To play along in our challenge, upload a photo of your project and provide a direct link in the linky widget at the bottom of this SCRS post. If for any reason the linky isn't there, please add a link to your challenge creation in the comments below. If you use an online gallery (e.g. Splitcoast), please also use the keywords SCRSC93 and SparkleCreations (no spaces). If you have a Facebook account and are a fan of Sparkle Creations Rubber Stamps, you can also upload there. Deadline for challenge #93 is Sunday, December 2nd @ 9 PM PST. Its my new stamp from Art Impressions. I love owl images...this is the cutest one ever!!! I used Echo Park papers and stickers for this card! Colored the owlies with Copics and added lots of glitter and stickles. 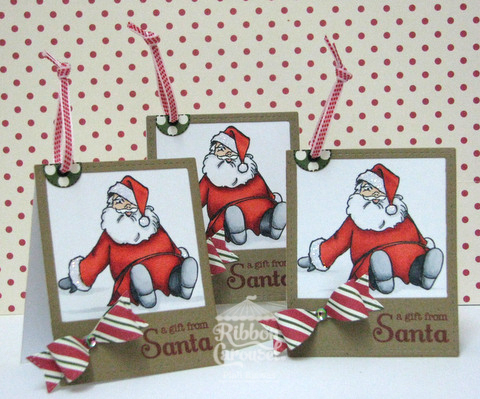 Addicted to Stamps Challenge : Christmas time. Dream Valley Challenges : Non-traditional Christmas. 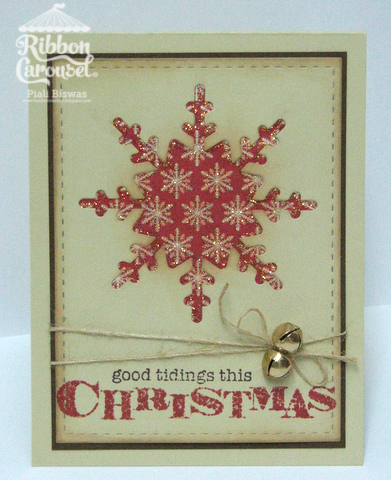 Stampin' Sisters in Christ : Christmas cards. Hanna & Friends : Animals. Next up is a cute tag.. I used a part of the whole stamp image for this tag...worked perfectly. 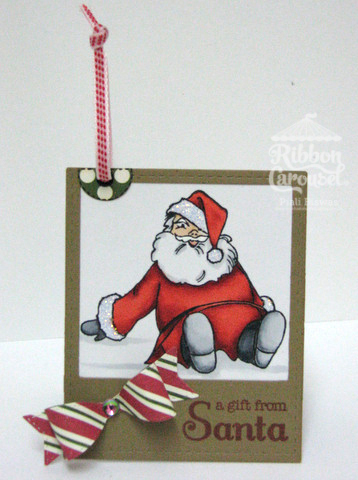 This lil' tag has lots of lovely ribbons on it...all from Ribbon Carousel. Sentiment stickers are from Simple Stories-Handmade Holiday collection. Crazy 4 Challenges: Put a bow on it! Live & Love Crafts Challenge : Christmas. Really Reasonable Ribbon: Anything but card. Just got few new goodies in the mail over this weekend..YAY!!! Three tags done....few more to do! 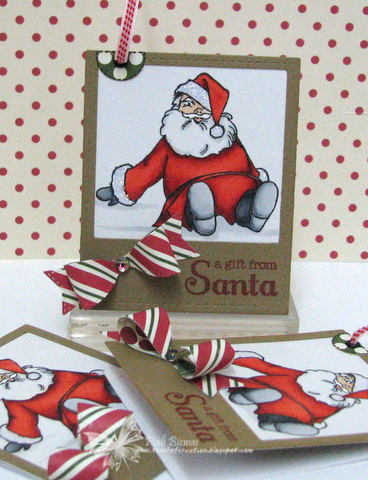 All new products are from Lil' Inker Designs.... the super cute Santa stamp set, lovely mini bow die and the fabulous photo frame die! The lovely ribbon is from Ribbon Carousel! DP is from Echo Park. I'm so loving this design, coloring them was fun...I'm gonna make a few more tonight! 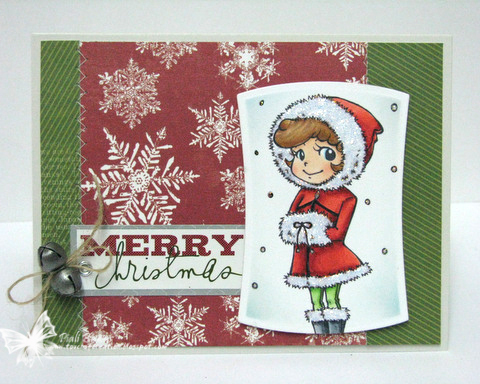 Paper Creator's Crafts : All about Christmas. I'll be back later with few more projects with some cute stamps from another fabulous stamp company( new to me)..
Hope you all had a Fabulous Thanksgiving Day...we had a good one!! I'm sure its a busy shopping day for Everybody in US...miss it a lot here! Today I did some mass producing...as Holidays are almost here and it takes a lot longer for the International mails, I like to mail my cards by Dec1st. Here is a design with some masking, snowflake, ribbon ,blings and lots of stickles...made 6 of them! Sorry forgot to take the set picture. All stamps are from Hero Arts! Snowflake is a Marvy Punch. The gorgeous ribbon is from Ribbon Carousel. Young Crafters Unite: Happy Holidays. I looooooooooove snowflake dies,punches and stamps !! My recent favorite is THIS snowflake die from WPLUS9. You all know by now that I absolutely love THIS Stitched mat die from Lil' Inker Designs. This card is set is my favorite so far!! The sentiment is from Hero Arts(CL630) set! I used distress ink and misted a bit before stamping...like the effect. These cards are for the following challenges.. Try It On Tuesday :Christmas sparkle. 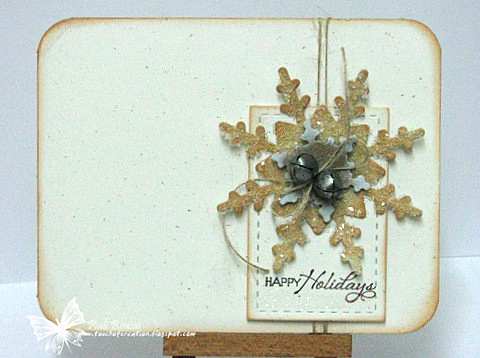 Ladybug Crafts Ink TLT Challenge: Snowflakes. Craft Room Challenge: Die cuts/punches. It's All About the Vintage: Glittering. Plum and Gold for Christmas combo...unusual isn't it???? When I saw the the lovely combo over at CR84FN, I thought of trying it out for a holiday card. I'm not a big Fan of Purple! I got some Bazzill Card Shoppe cardstock.....absolutely loving it, very smooth and sturdy!! 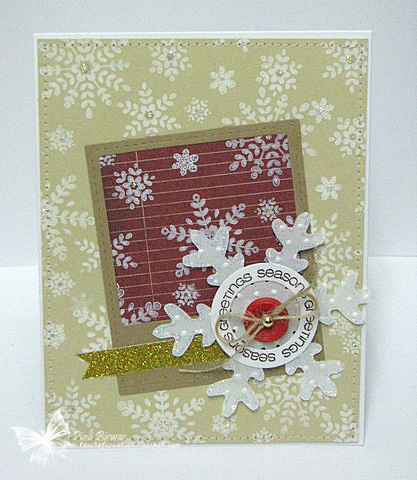 The Snowflakes and label diecuts are from Spellbinders. I used some Curly Sparkling Gold Trim, Jute Twine and lots of gold glitter for this sparkly plum card!! Glitter n Sparkle: Lots of Layers. 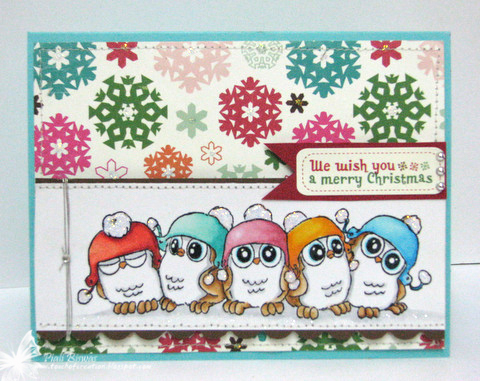 I used some square punches , Fancy Pants papers& stickers and CAS-ual Fridays Stamps for this card. There is lots of stitching and lil' bit of washi tape too! !